Day Fifteen, we are officially half-way through our campaign here, and in all sincerity, the shock and wonder of the first couple days still hasn't worn off. You guys, you guys... just... you guys! We've got a couple things to share with you today, in no particular order. 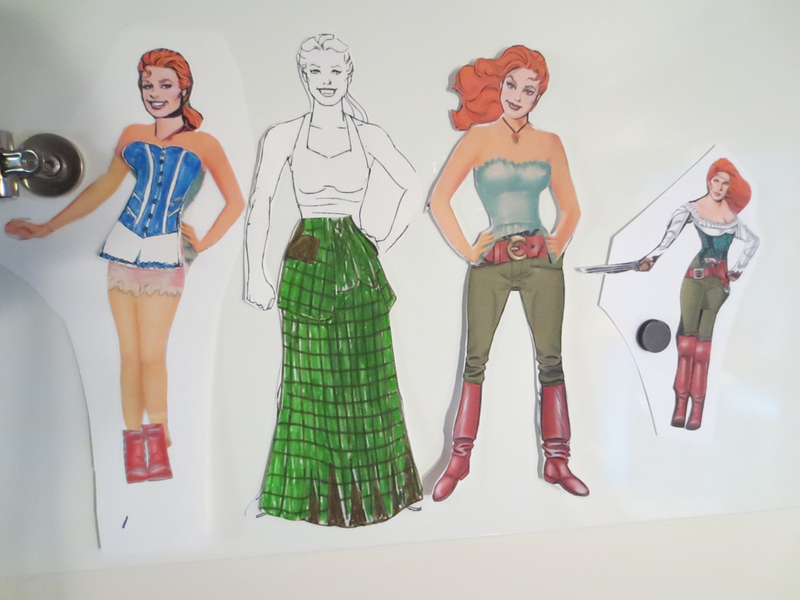 Linda Candello has been working with Rick on the preliminary designs for the Lady Sabre paper dolls, and despite her protestations, I got her to send a couple images to me to share with you. 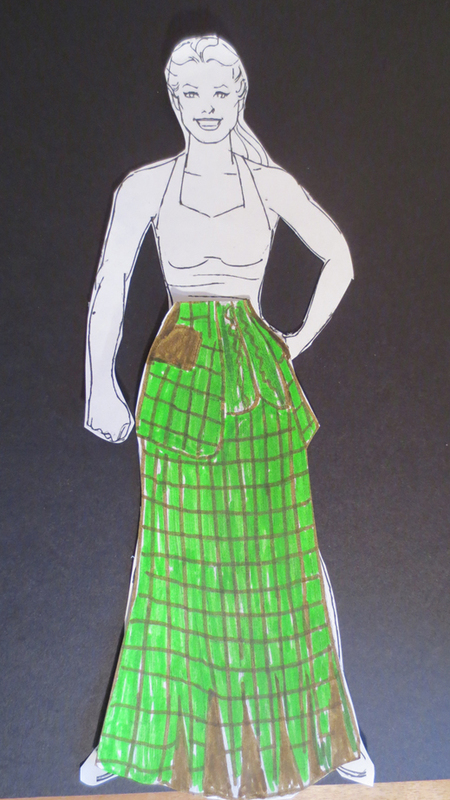 We're early in the process yet, and Linda is still designing costumes and accessories. It occurs to me that actually doing a thread over at the Lady Sabre & The Pirates of the Ineffable Aether site where folks can suggest costumes, outfits, etc, for the dolls might be pretty fun. Let me know what you think of that idea, and if it's a thumbs-up, I'll get it up and running. I've seen some of the more... inventive designs Linda's playing with, too, and I think this is going to be exactly what we were hoping for, or, in other words, a heckuva lot of fun. Rick, Eric, and I are doing a Google Hangout this coming Wednesday, at 6pm Pacific, 9pm Eastern. We'll post the relevant information on Wednesday morning. Please come and join us, bring your questions and your comments, and your sense of humor. With apologies to Buzz Lightyear. So I've mentioned before that we'd been exploring a different edition of the book that would sort of fill-in the middle ground between the Rare & Royal edition and the basic edition, and we've come up with something we really like, and that is, in fact, one of the ideas we had from the start but had backed away from for fear of cost. We're closing in on A Better Book For All at 90K, and if we make it, we'll unveil this new tier, called The Style to Which She Is Accustomed. We're delighted that both the Hinges and Dirigible Days Kickstarters have successfully funded, each still with time to go! Very much looking forward to reaping those rewards when they start shipping! As far as that goes, the AR-K Kickstarter is entering its final days. I did a video Q&A from questions that had been submitted that went up today - the video is below - and we're taking more questions for another round later this week. Thank you all for your continued support and backing! This has been such an incredibly experience thus far, and it's because of you. Keep spreading the word about our campaign! If we make it to the final goal, that's Pegasus deckplans for everyone! Julian -- I think at this point, we're planning to leave that edition as-is. But if you really want one, keep an eye out. For instance, there was a brief period this morning where we had a cancellation and there was one available. Any chance you'll be able to open up more Rare & Royal editions? I'd love to get it. *wonders what the new tier will entail* If it's limited and I like it, I also hope I'll be ON time THIS time.